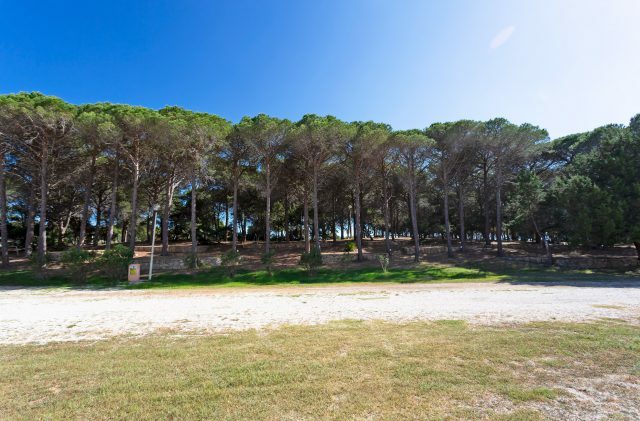 Camping Cala Ginepro, a campsite immersed in the untainted natural environment of Sardinia, offers more than 550 pitches and mobile homes in the lush pine forest. Nestling amid luxuriant pine, eucalyptus and fragrant juniper trees, Camping Cala Ginepro faces directly out to see, with three direct outlets – one each to the two wonderful beaches and one to the reef. The pitches are mostly shaded and include access to a nearby power supply, use of which is included in the price. The campsite’s verdant pine forest is ideal for those who want to enjoy a relaxing holiday in the great outdoors. Camping Cala Ginepro can play host to caravans, camper vans, vans and tents of all types, including air-camping. The pitches on the campsite are numbered, but are deliberately not delineated – the multiple power points offer CEE-standard electricity (max 5A), and it may be a good idea to bring an extension cable. The sea is easy to reach even with strollers, thanks to the convenient walkways that lead to the beaches of Cala Ginepro and Sa Mattanosa. The fine white sand, the crystal-clear water and the shallow seabed that slopes gently downwards make these beaches ideal for children, who can play on the shore and start to get confident in the water. The stunning reef of Cala Ginepro, located between the campsite’s two beaches, is perfect for peaceful moments and offers captivating views of the beautiful natural surroundings. During the summer, an entertainment service is laid on with numerous proposals aimed at children, families and young people. From April to October, at Camping Cala Ginepro you will find the bar service with artisanal ice cream made in-house, the restaurant/pizzeria with delicacies from land and sea, the market, where you can purchase gas, and the newsagent / tobacconist with the bazaar – you can also hire sports equipment… and much more besides! Choose your pitch and discover all the services on offer on your campsite in Sardinia!